Lace up the Keen Gypsum Women and rack up the trail miles. For stability, comfort and moisture management, the Keen Gypsum Women delivers with built-in technology including a specially designed 4mm lugged outsole, KEEN.Zorb strobel and KEEN.DRY waterproof breathable membrane. The Keen Gypsum Waterproof Trail Shoe provides stability and comfort mile after mile. Whether you're hitting the trails or running errands around town, you'll appreciate the straightforward, low-profile appeal of the Gypsum. This lightweight shoe features a waterproof nubuck upper, Dri-Lex collar, and Keen.Dry membrane for exceptional moisture control. For cushioned support, the Gypsum offers a range of innovative features, including an S3 heel-support structure system, TPU shank, and EVA midsole. Keen.Dry waterproof membrane and Dri-Lex collar wick away moisture. Metatomical EVA footbed provides arch support. View larger. The Gypsum features a lightweight, flexible design with tonal stitching accents, a sleek silhouette, and a lace-up front. The neutrally colored upper showcases pops of color on the laces and around the heel. Because conditions can change suddenly, the Gypsum provides a range of different moisture-protection features. The waterproof upper keeps water out while still allowing your foot to breathe. For an additional layer of breathable protection, the Gypsum has a Keen.Dry waterproof membrane and a Dri-Lex collar that wicks away moisture and vapor to guard against odor. For exceptional support throughout your day, the Gypsum has both a dual-density, compression-molded EVA midsole and a removable Keen Metatomical EVA footbed that provides arch support by hugging the natural contours of your foot. Additionally, Keen.Zorb Strobel--a full-length, foam-based cushioning layer--delivers a comfy, broken-in feel from the first step. To keep you going longer, the Gypsum's midsole has a torsional-stability shank made of TPU. This shank helps stabilize your foot as you move, reducing fatigue so you can go further, see more, and feel better when you get there. S3 stands for Shock, Suspension, and Stability and refers to Keen's unique heel-support structure. S3 is engineered to support the foot on impact, dissipating shock and helping to prevent ankle injuries. To give you a steady grip on a variety of terrain, the Gypsum has 4-millimeter multi-directional lugs on its non-marking rubber outsole. Because they're spaced wide on the sole, these lugs "bite" into the terrain, giving you more dependable traction on slippery and uneven surfaces. Because rocky objects and debris can trip you up on the trail, most Gypsum styles include Keen.Protect, patented toe protection that wraps up and over the outsole for thorough coverage of the entire toe bed. 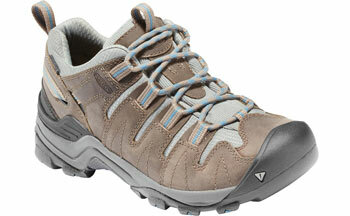 Keen Women's Gypsum Waterproof Trail Shoe.